Great Great Grandmother Was a Homesteader… And Workin’ ‘Round the Weather! Sophronia was a plucky lady, widowed first when my gg grandpa William Slyter died in the Civil War, and again a few years later when her next hubby, Isaac Fuller, got hit by lighnin’. Then in the 1870s a Sophronia Fuller pops up in the Government Land office records, homesteading a quarter section near Springfield in southeastern South Dakota… Dang good land! 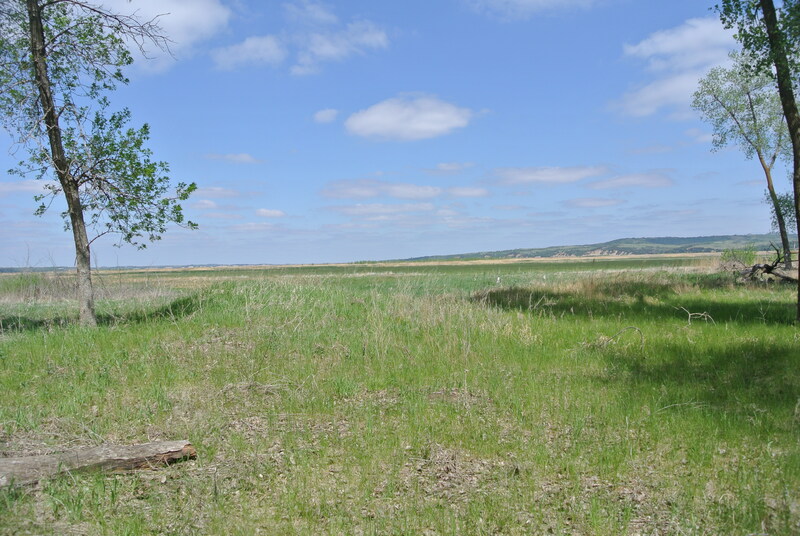 Sophronia also bought outright a few acres in the Missouri River bottom lands a couple miles away, may have been farmable at the time, but after the most recent floods… This was a bit of high ground, most of the acreage was too wet to hold a tree up. But Sophronia didn’t hang around long, couple years later she’d married a West Daggett and was back in Wisconsin, where she remained in Whitehall ’til her passing in the first years of the 20th century. 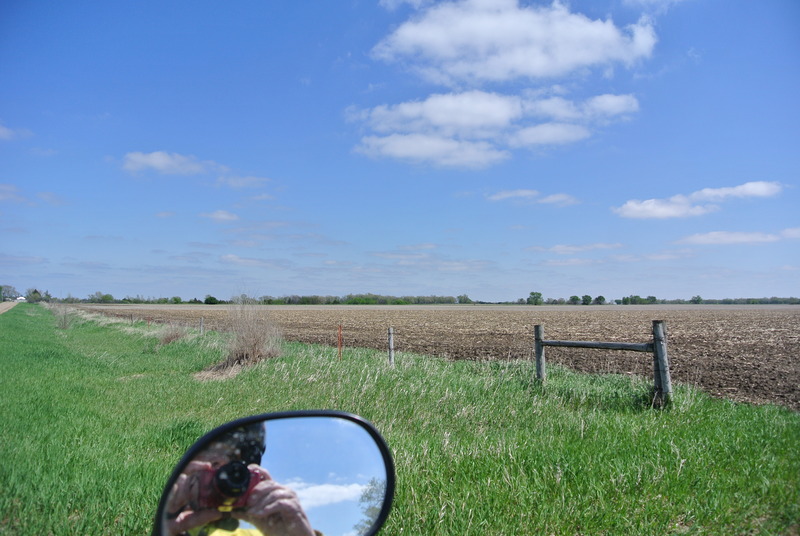 Did all this reconning on my way to the Big Sioux Riders spring campout at Fort Randall on the Missouri River. Finally dried out on friday so had a nice ride there with the sidetrip to check out Sophronia’s claim, followed by a lovely day saturday as we explored the river valley to Niobra and back. The forecast for saturday night and sunday was foreboding.. 90% chance of rain, with snow in the Black Hills! This didn’t help attendance any, and at peak we we’re up to about 15 sociable souls. Then one of the riders crashed on some unsigned pavement grinding on the way to the campout, and a couple other riders with a trailer went to give the rider and battered bike a ride home to Sioux Falls, they didn’t come back. A few more riders headed home during the day saturday and for a while we were down to four of us to lay waste to 30 brats and equal proportions of beans! I checked the weather at around 4 pm and it was looking better- down to 50% chance of rain heading east, but 90% on the northward leg to my Buffalo Ridge abode… I decide to stay the night instead of hightailin’ home. Then reinforcements arrived in the form of two more club members, we didn’t shame them for arriving by car. We had to get moderately resourceful, cheating by using gasoline to start our camp/cook fire in the rain. Did the brats and beans up good, and the rain and wind pretty much held off ’til we were too tired to stay up any later anyway. Was warm and dry in my tent, didn’t even zip up the sleeping bag all the way. Morning brought an even better forecast… a couple hour window of opportunity with but 30% chance of rain, and 50% chance for the last miles home. Had a tangerine, couple a snack bars, and couple cups of coffee and skipped breakfast and headed east, with the rain about 50 miles north. Had a dry ride save the odd raindrops, marred by some drizzle for the last 50 miles when I turned north towards home. So watch the weather… But don’t let the weather keep ya home!